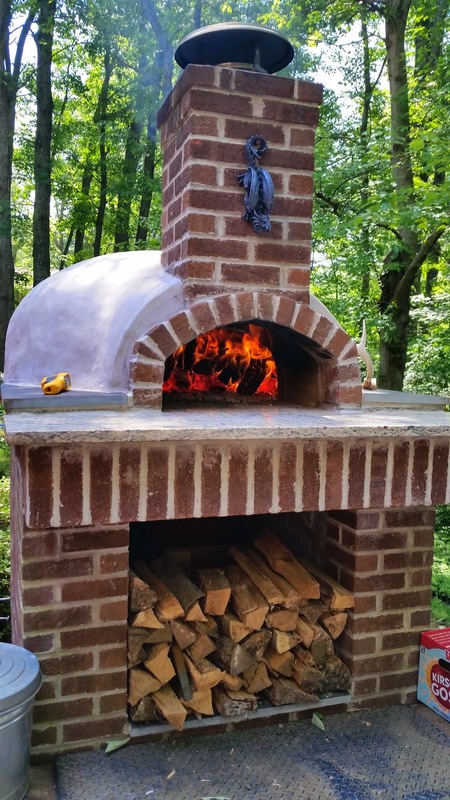 One of the themes you can expect to read about here is our wood fired pizza oven. I am working on a post on pizza, but in the meantime, here is something you can warm up with: Cecina. This is one of my new favorite things to make in the pizza oven, and it can be made while the oven is getting up to pizza temperature. Cecina is a sort of Tuscan flat bread made with chick pea flour. I only recently learned of it, but I am certainly glad I did. I was showing off pictures of our backyard pizza oven, and one of the people in the conversation happened to be a woman from Tuscany. We got to talking about focaccia, and she mentioned that a good thing to make in a wood fired oven is Cecina. I got some more info, and it turns out to be very easy to make. It’s also very tasty. Measuring ingredients by weight, you use about 1 part chick pea flour (ground fine like corn starch) and 3 parts water. By volume, the amount is about equal as the chick pea flour is very light. I got a bag of Chick Pea flour at an Indian grocery store. Mix the flour and water in a bowl several hours before you want to bake the Cecina. This allows the flour to hydrate and dissolves lumps. The batter is very wet. An 11” skillet takes about 2 cups of batter per batch, so make enough to make a few batches. You’ll be glad you did. Just before baking, whisk the batter a bit to stir up the flour that settled to the bottom and break up any lumps. Take a cast iron skillet and pour in some olive oil, 2-3T is good. Pour in the batter to about ¼” deep. Pour a little more olive oil over the top, and season with minced fresh herbs (I use a blend that is mostly rosemary), coarse sea salt, and fresh black pepper. Lightly stir the top and place the skillet into the oven. If you do this in your kitchen oven, get it at least 400-450F. The pizza oven is at about 600F for Cecina. Bake until it chars a bit on the top and edges. When it is done, you can cut it in wedges and pick them up to eat. The herbs on top and the char give a great flavor. Experiment with other ingredients you like. For example, I pan roasted some garlic shrimp in a cast iron skillet, then after the shrimp and a portion of the garlic and oil were eaten, I poured in the Cecina batter and made a version with shrimp essence and a lot of fire roasted garlic. 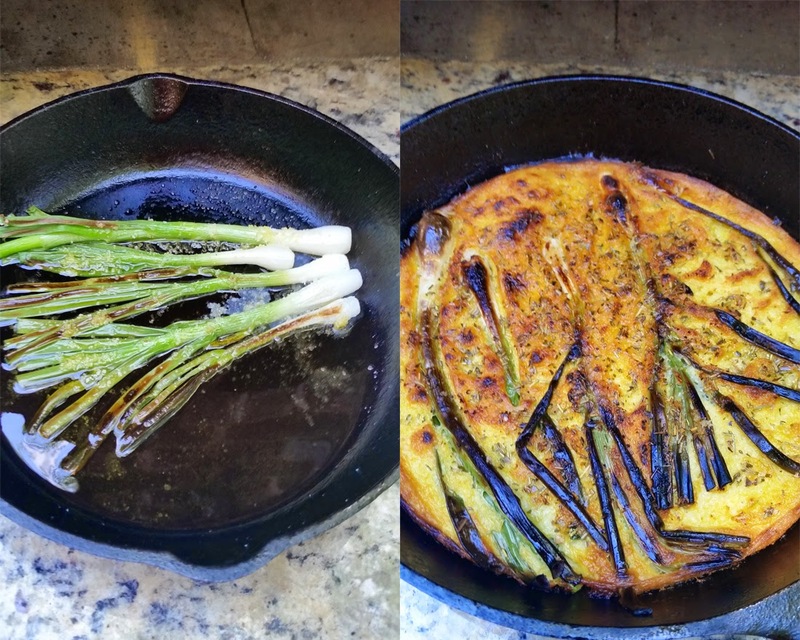 This weekend, I pan roasted some fresh Spring onions from my garden, and then baked them into a Cecina. Delicious!